It’s all about the traditional flick when it comes to embracing the wonders of eastern clothing. It draws us toward a more meaningful and highly embroidered staples that resonate our cultural taste. With inclusion of ready-made wear, Savers Pakistan proudly presents the wide-ranging collection of Women’s Eastern Clothing to add the element of elegance in your mundane attendance. 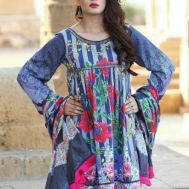 Explore Kurtas & Shalwar Kameez, Scarf/Dupattas, Pants & Trousers, Abayas & Hijabs, Lehenga/Ghaghara and the unstitched fabric for tailor-made wonders for women of Pakistan.